Hello! I'm a 61-year old grandmother of ten -- nine granddaughters and one grandson. I have three daughters and a son and have been married 42 years (I went steady with my husband when I was 11). I'm no longer working as I was disabled three years ago with arthritis and scoliosis. My husband worked as a longshoreman for about 40 years and is now retired also. I spend a lot of time with my grandchildren and with my computer doing all kinds of puzzles and reading. I've lived in New York State all my life. Haven't travelled much, but never really wanted to. Guess I'm just a homebody. Don't like to be away from my family. I graduated when I was 17. Have always been interested in word games. Found the crypto in the newspaper when I was in my early teens and have been working them ever since. Nothing serious. No competition or anything, just for fun. I love to read and learn new words. I try to learn at least one a day. Not always possible, though. I got my first real job with an insurance company when I was 17 right after I graduated, but didn't stay too long. My longest job was my last which was an Assistant Manager for a company that assisted corporation attorneys in filing papers such as Mergers, etc. I stayed there for 36 years and I loved my job. I always wanted to become a paralegal, but never found the time. I moved to Averill Park from Albany a little more than 20 years ago and love it. Of course, I don't know too many people, not being able to do too much, but I have enough to keep me occupied. The only hobbies I have are cryptograms, any kind of puzzle or crossword, the computer, and definitely my reading. I also enjoy watching legal programs on TV such as Matlock, Murder She Wrote and Perry Mason. I used to love to walk but I can't do that any more. I was also very active in sports having been into cheerleading, volleyball, softball, etc. 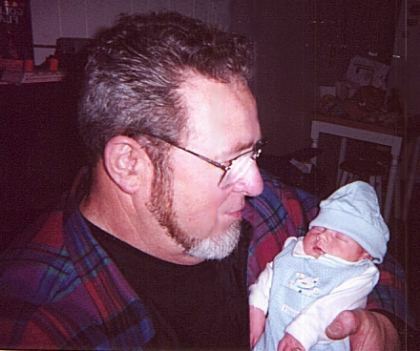 TYLER STEVEN with his great grandfather! 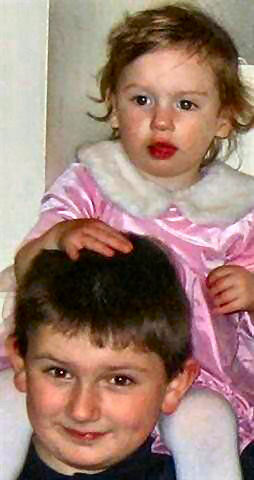 Here's the latest picture of the kids taken on Thanksgiving, 2007! Melissa is 2, Tyler is 8.